There is nothing like a few hours browsing at a flea market or an antique shop to give us a glimpse of how things were in another time. Old artifacts can evoke the fragrances, the look and the feel of times gone by. We catch a glimpse of an old brocade purse and think of the one grandma carried to church each Sunday. A silk evening bag alongside a string of pearls are reminders of a school dance. Dempsey Essick and his wife, Shelley, recently spent a few hours in the Market Place Antique Mall in Winston-Salem, NC. Two employees who work there, Gail Yaroch and Kevin Beck, when they learned that the well known Lexington artist was looking for nostalgia items for a still life painting, were very helpful. In fact they were running around all over the place bringing items that Dempsey might use. Dempsey has arranged the selected items casually atop a beautiful embroidered tablecloth. The ornate hand mirror, the perfume atomizer, a cameo pin, and a string of pearls randomly draped across the whole. 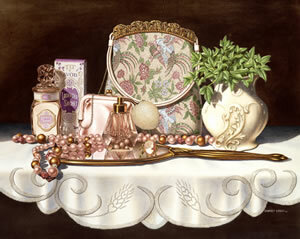 The handbag in the background is flanked by a vase with green leaves to remind of the present and a bottle of Lavender Sachet from which the painting derives its name. At the height of his skills as a painter, Dempsey Essick does things with light and shadow that no one else currently working in the medium of transparent watercolor can match. Lavender Sachet is one of those paintings that younger viewers can enjoy and come away with a feel for the atmospheres of times gone by. Older viewers can fall into a mood of quiet reflection, remembering.